This is the first in I suspect what will become an ongoing series of posts about some of the hazards for navigating Adelaide by bakfiets, and how I work around them. Rail-way mazes are designed to let pedestrians, wheel chairs, electric scooters, and normal-sized bikes through. 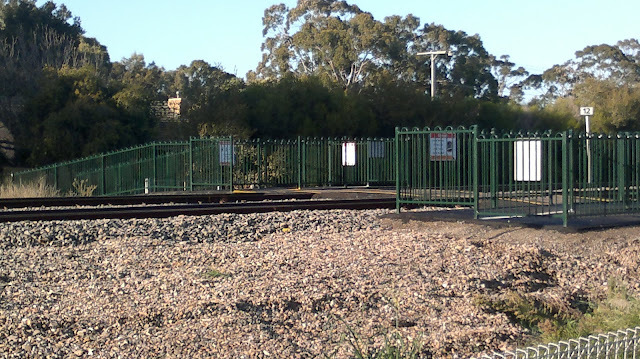 The newer ones are blessedly much larger, such as this one where the Sturt River culvet and Noarlunga line cross on the Sturt River Linear Park. I suspect the larger size is to better accommodate electric scooters and probably even bikes with trailers. However, they aren't quite big enough to allow a bakfiets through without having to lift the tail and pull it around a couple of feet. Proof that I can at least get my bakfiets into the maze! View of interior of maze. It's about three metres from side to side (left to right in the photo), allowing a bit of room to do repeated 3-point turns to get it most of the way around. But the depth (the same as the length of the white line on the ground) is too shallow to allow the bakfiets to turn around, or even be 3-point turned around without the bike eventually hitting the centre rail. This can be remedied by getting it as far around as you can, and then picking up the rear end and pulling it around half a metre or so, after which the bike can be walked around the corner. A bit tricky if you are not reasonably strong, or have a lot of stuff/kids in the bike. View of the entire maze crossing the Sturt River. 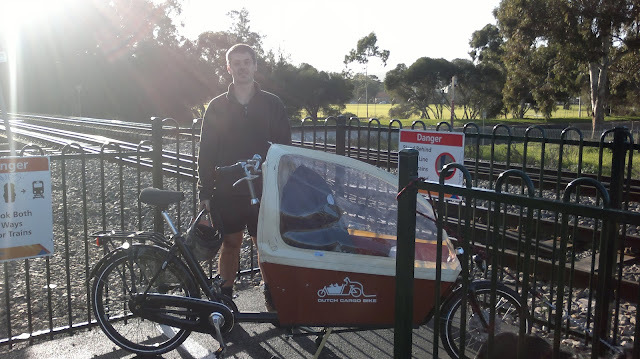 Between Marion Road and Morphett Road, I believe that the Sturt River crossing shown in these pictures is the only crossing that you could navigate with a bakfiets like ours. The one at Marion Station is probably slightly too small (I will confirm this at some point), and the one along Murray Terrace is way too tight -- I can't even get our old bike trailer through. 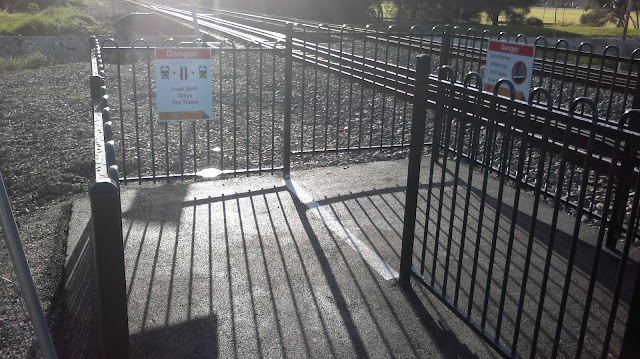 Most of the older mazes are too small to even do this, so be careful, especially if riding on the footpath with kids in the box when you approach level crossings, as you may be forced onto the road. 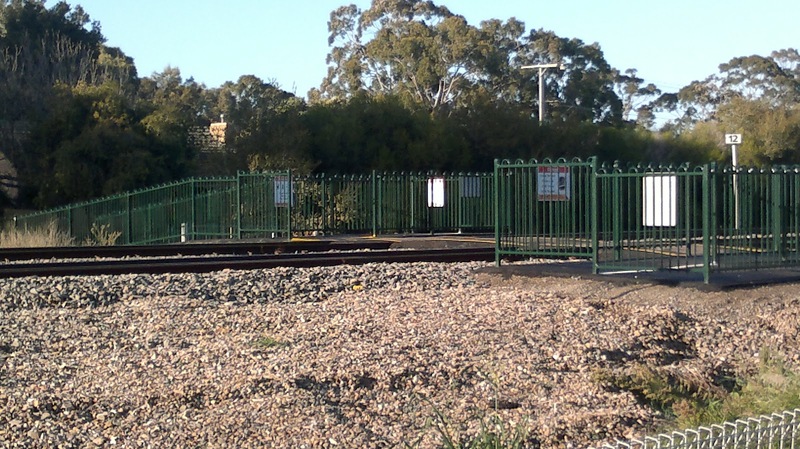 This happened on the weekend heading west along the northern side of Daws Road, i.e., the opposite direction to traffic flow, towards the Tonsley line railway crossing. We had to either from walk the bike along the bike lane on the wrong side of the road, or walk the bike backwards along the narrow footpath until we could turn the bike around, and backtrack.